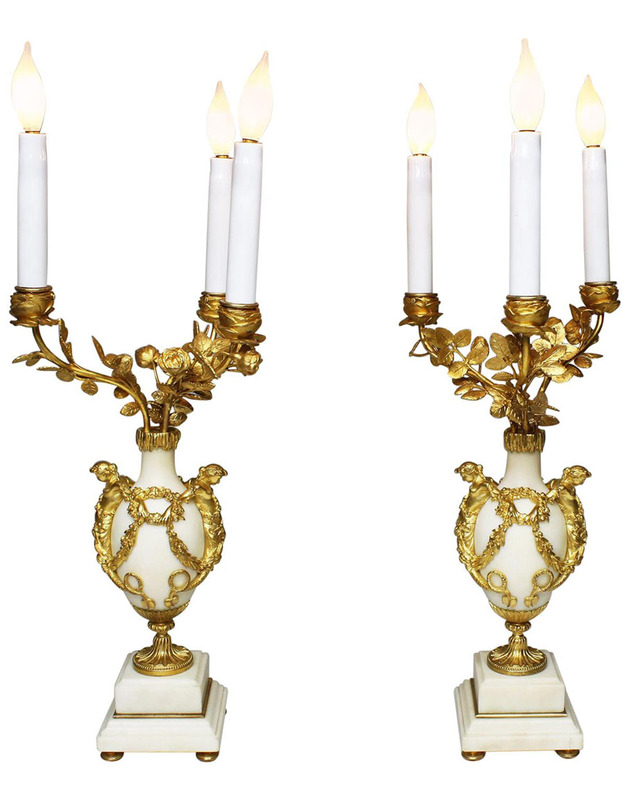 A Fine Pair of French 19th Century Marble and Ormolu Mounted Figural Urn Three Light Table Lamp Candelabra. 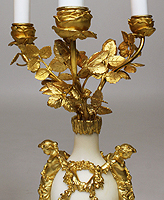 The ovoid white marble body surmounted with a pair of mermaids holding hands with floral wreaths below an icicle neck below a three light candelabra surmounted with branches with leaves, the candle holders in the shape of rosebuds, the candle sleeves are Opaline glass; raised on a tapered square plinth with gilt-bronze token legs. Attributed to Henri Piccard. (Electrified) Circa: Paris, 1870-1880. The fondeur and doreur Henri Picard was recorded at 6 rue Jarente in 1831, and moved to 10 rue de la Perle in 1839. The firm supplied objects to Emperor Napoleon III's apartments at the Louvre, and was reputed for its fine quality decorative production of bronzes, pièce de table and garnitures de cheminée. A Fine Pair of French 19th Century Marble and Ormolu Mounted Figural Urn Three Light Table Lamp Candelabra. 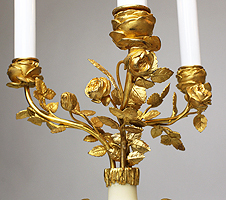 The ovoid white marble body surmounted with a pair of mermaids holding hands with floral wreaths below an icicle neck below a three light candelabra surmounted with branches with leaves, the candle holders in the shape of rosebuds, the candle sleeves are Opaline glass; raised on a tapered square plinth with gilt-bronze token legs. Attributed to Henri Piccard. (Electrified) Circa: Paris, 1870-1880. The fondeur and doreur Henri Picard was recorded at 6 rue Jarente in 1831, and moved to 10 rue de la Perle in 1839. 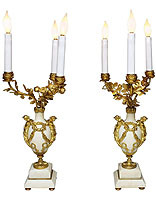 The firm supplied objects to Emperor Napoleon III's apartments at the Louvre, and was reputed for its fine quality decorative production of bronzes, pièce de table and garnitures de cheminée.